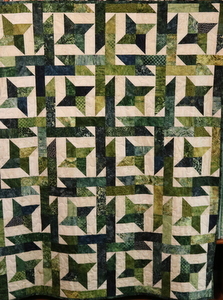 This quilt measures 48″ x 60″. It is made with beautiful shades of greens. The batiks in this grouping are vibrant and striking. This can be your 4 week class project. Made with 2 1/2″ strip sets.